UPR's exclusive ABS design will add up to 40hp on the following Supercharged applications, 1986 to 1995 Mustangs equipped with a Vortech, Paxton or Powerdyne supercharger system. This system will yield the best price and performance against any other kit available without question! 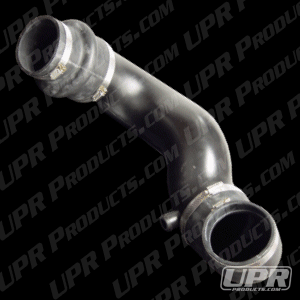 The New ABS UPR Boostmaster pipe was developed because of the need for an affordable Supercharger intake pipe that would outperform all the competitors pipes by having the densest and coolest air intake charge ever. Our design requires the mass air to be mounted in the inner fender for the coolest air charge. The results from our new revolutionary new ABS design as tested on a 1993 GT with a Vortech S-Trim and a 1992 LX with a Paxton NOVI 2000 were Incredible ! The two cars went as follows: 93 GT gained 5lbs. of Boost from 9lbs. of boost to 14lbs. and went 2.5 tenths quicker and gained 4.6 mph at the track. 92 LX gained 4lbs. of Boost from 13lbs. of boost to 17lbs. of boost and went 2.3 tenths quicker and gained 4 mph at the track, both cars gained between 35hp to 40hp. Made from 4" ABS plastic for the coolest, densest charge possible. Installs in 1 hour or less. 1986 1987 1988 1989 1990 1991 1992 1993 1994 1995 5.0 V8 Mustang Steeda Roush & Saleen Vehicles. No one else can stack up to the bold clean styling of our aftermarket Billet dress ups, Street Strip & Racing Suspension & Performance Parts for your late model American Muscle Car!